This kit contains all the parts needed to upgrade a standard 32K RC2014 Full Monty kit running BASIC in to a 64K RC2014 running CP/M. Essentially, it comprises of a Pageable ROM Module, a 64k RAM Module and a Compact Flash Module, along with a PROM pre-programmed with 56k Microsoft BASIC and CP/M Console, and a 128mb or 64mb compact flash with CP/M 2.2 installed. The compact flash socket is a surface mount component, and will be supplied pre-soldered to the PCB. This kit assumes that you already have the RC2014 Full Monty kit as you will be using the backplane, clock, CPU module and serial I/O module from that kit. 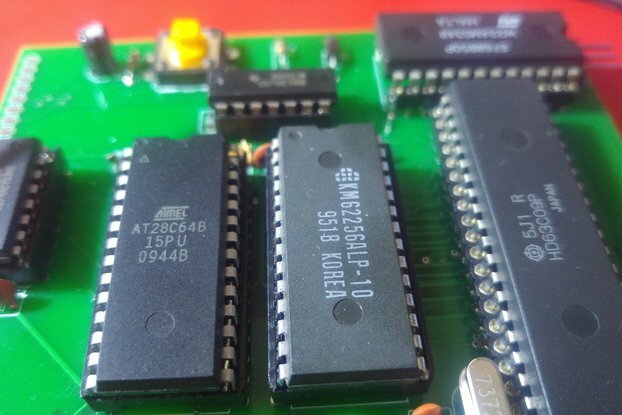 You will also be reusing the 62256, 74HCT04 and 74HCT32 chips from the ROM and the RAM modules. This kit represents a saving of over $17 compared to buying the modules individually - however, if you already have components such as a blank compact flash card, or wish to solder the CF socket yourself, you may be better off picking and choosing from the separate module options. All items supplied in this kit are new, with the exception of the compact flash card. This kit works great with the Raspberry Pi Zero Serial Terminal, but if you wish to use any of the input/output modules, please see this article about modifications that may be needed. Although not necessary, you may wish to consider upgrading to the Backplane Pro too.